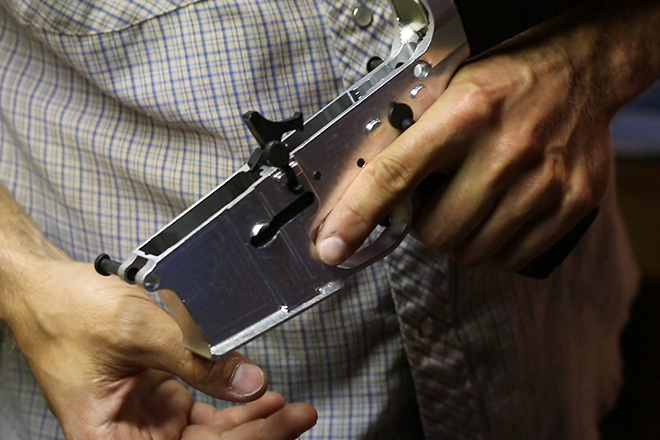 First it was the 3D printed pistol, then it was a 3D printed rifle, now Cody Wilson of Defense Distributed has come up with a desktop CNC machine designed specifically to finish out 80% lowers. Coming on the heels of California Governor Jerry Brown's veto of the "Ghost Gun" bill, Wilson - a self-described anarchist - as taken another shot at government overregulation with the Ghost Gunner. That simple chunk of metal has become the epicenter of a gun control firestorm. A lower receiver is the body of the gun that connects its stock, barrel, magazine and other parts. As such, it’s also the rifle’s most regulated element. Mill your own lower receiver at home, however, and you can order the rest of the parts from online gun shops, creating a semi-automatic weapon with no serial number, obtained with no background check, no waiting period or other regulatory hurdles. Some gun control advocates call it a “ghost gun.” Selling that untraceable gun body is illegal, but no law prevents you from making one. According to their website, Defense Distributed has already sold more than 250 units and expects to close pre-orders shortly. With the price already raised from 999 to 1399, it would take a heck of a production run of lowers to justify the cost - but I'd still love to have one in the garage just in case. The emergence of desktop CNC and 3D printing will be a revolution in manufacturing and will challenge a lot of the ideas of what was possible. The government has already shown it's willingness to crush this kind of innovation in the firearms world but will they be able to once machines like the Ghost Gunner are mainstream and manufacturing is no longer centralized with large corporations?